OK, friends, I’ll be honest. I’m not really that sure what to do with this blog now that I’m back. I mean, many of you are reading it (were reading it) because it contained news of someplace where I was in the days of travel and wonder. Now, well, pretty much I”m here. I’m around. Oh, there may be the occasional steelhead trip, but I don’t think I’ll need the passport in the near future. But I don’t want to just end, either. So I’m dragging it out. This evening, I thought I’d post the text of the message that I shared with the good people of the First U.P. Church of Crafton Heights on Sunday, October 24 -my first Sunday back in the pulpit. If you’ve read the blog before, well, some of these ideas aren’t new. The last time I stood up here and spoke to you, we were all a lot younger. I talked about “Spiritual Presbyopia”, and about my prayer that a time of Sabbatical would enlarge our ability to see truth in the world and in each other. I’m sure that everyone who was here that day remembers that breathtaking message with remarkable clarity, but just in case, you can find it on the website if you want a quick refresher. At any rate, I’d like to tell you about something I saw while on Sabbatical. You can bet the farm, incidentally, that you’ll hear more about some things I saw, but this morning I want to speak to one place that was simply amazing. 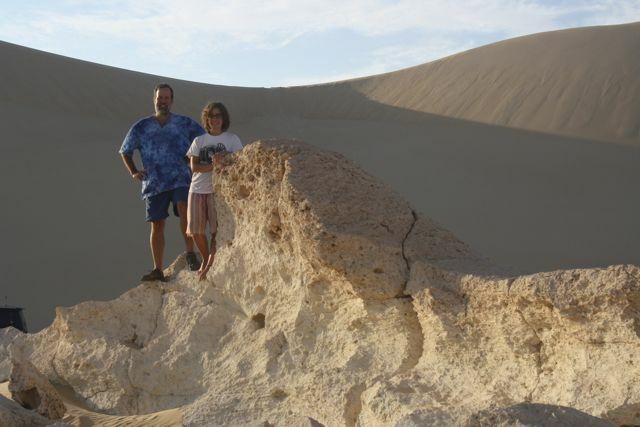 My daughter Ariel and I were in the Middle East for about five weeks. Wow. I have never been one of those people who is dying to make a pilgrimage to the Holy Land. I lived 50 years without seeing it, and could have made it a few more. But by the grace of God I was there. But the Holy Land about which I want to talk this morning is not in Israel. It’s in Egypt. I want to tell you, that place is a desert. As far as your eye could see, for mile after mile, there was nothing. Not a shrub, not a tree, not a camel, not a bird. My first thought when I encountered this place was that it was amazingly beautiful. That thought faded after a couple of hundred miles, and I thought about the Children of Israel walking across this desert for 40 years, and I remembered the fact that they grumbled against Moses, saying, “Did you lead us out from slavery so that we could die here in the Desert? At least in Egypt we had onions to eat. Here, there’s nothing! 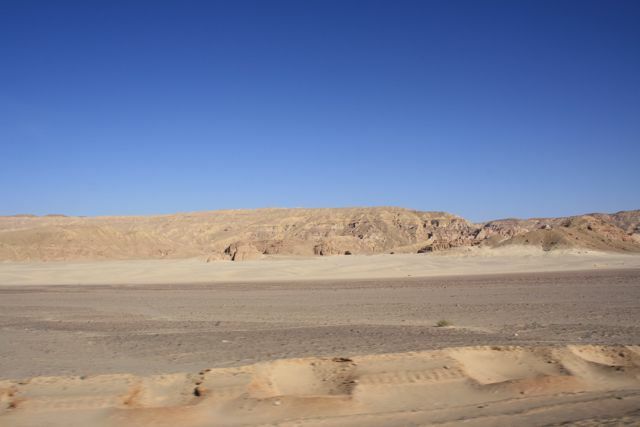 This is miserable.” As I spent more than a week traversing the desert of both the Sinai peninsula and the Sahara Desert, I have to say that I did not blame the Israelites for their comments. The desert is a fierce and terrible place. I simply cannot capture for you the vastness of this wilderness. The Sahara desert is 3.5 million square miles. The desert is as big as the entire USA…think of that: From California, to the New York Island; From the redwood forest, to the gulf stream waters…all a barren, dry, deathly tedious place. To be sure, there were some amazing sights – but I was traveling in a Land Cruiser and had a lot of water. The desert was oppressive. I remember laying on my mat at midnight trying to fall asleep and being unable to because it was over 90 without a whiff of fresh air moving. For three weeks, I did not see a single cloud. And the sand…oh, Lord, the sand. I had sand in my water. Sand in my luggage. Sand in my food. Sand in my clothes. I’m telling you, I had sand in places that I didn’t even know I had places. It was brutal. 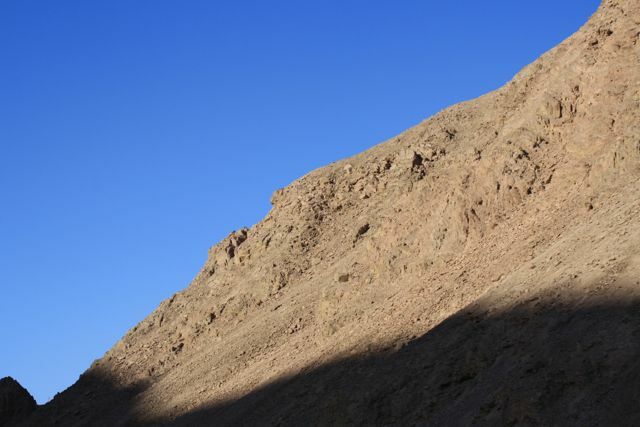 Now, as many of you have heard me mention, the desert was also a fascinating and beautiful place. I saw wonderful rock formations and more types of sand than I knew existed. 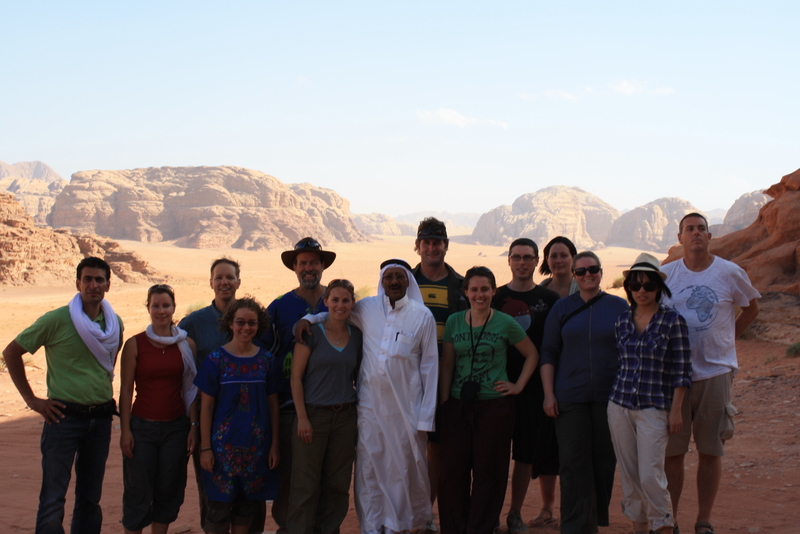 I did see some animals, and I experienced the hospitality of some Bedouins that was a joy. Can you believe it? 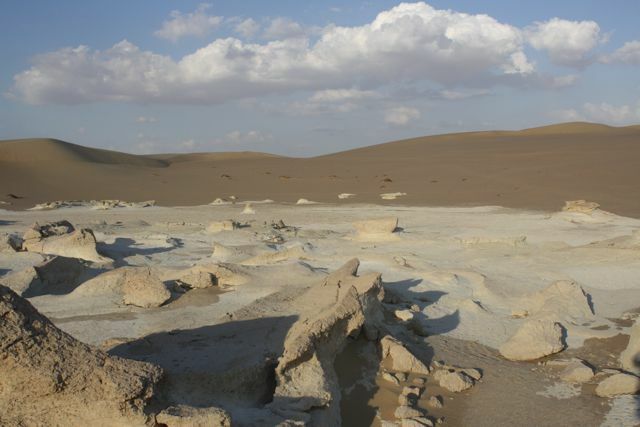 The Sahara was once an ocean floor! And not just this spot – they have found fossilized sea shells in Morocco and in Niger; the Pyramids in Giza are constructed with limestone that contains seashells in it. I picked up this shell from the spot where I’m pictured, and this coral from another spot hundreds of miles away, towards Alexandria. This hot, dry, oppressive place was not always that way. It occurred to me that the apparent barrenness of the desert is not God’s intention for his creation. Genesis is clear about that – the creation is teeming with life. Water is abundant. Order is brought forth from the midst of chaos. But something happened. There was a fall. Sin entered the creation. The good and life-filled gift that God had made became infected. The creation became marred and scarred. More and more, death and desert places became “normal”. Toxicity and dryness and barrenness became unsurprising companions. 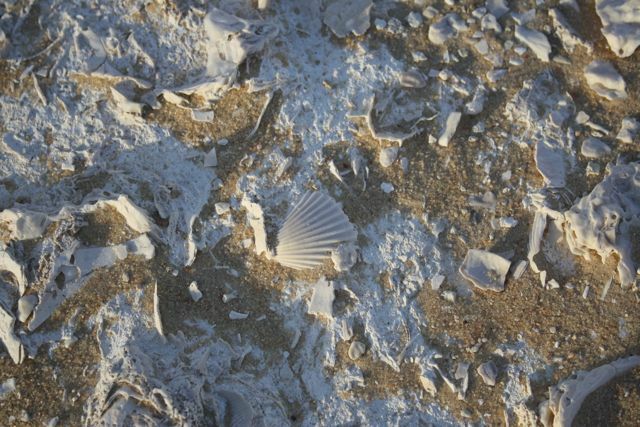 Yet as I reflect on the beauty of God’s love and the intentions that are displayed in the Scripture, I ask myself, “Why shouldn’t I find seashells in the desert?” The seashells remind me of God’s action in the past; they affirm for me God’s intentions for his world; and they point me to a hope for the future in which desert and death and oppression and sterility will be no more. And I was thinking of all of those things when I got to my absolute favorite place in all of Egypt: an oasis near the Libyan border called Siwa. When I say it’s an oasis, what do you think of? 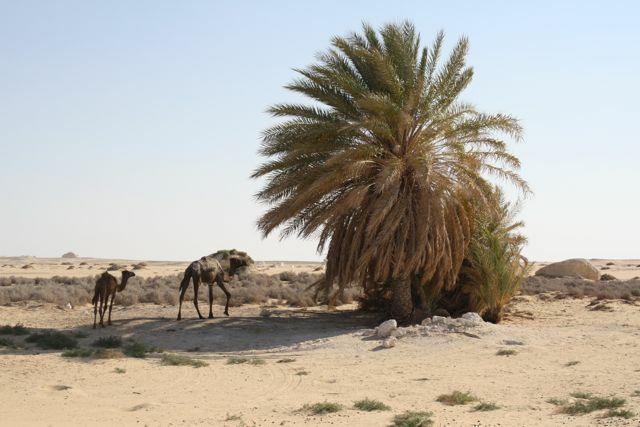 If you’re like me, you think that an oasis is a couple of camels, a tree, and a puddle of water. Well, I did see that, but that’s not Siwa. 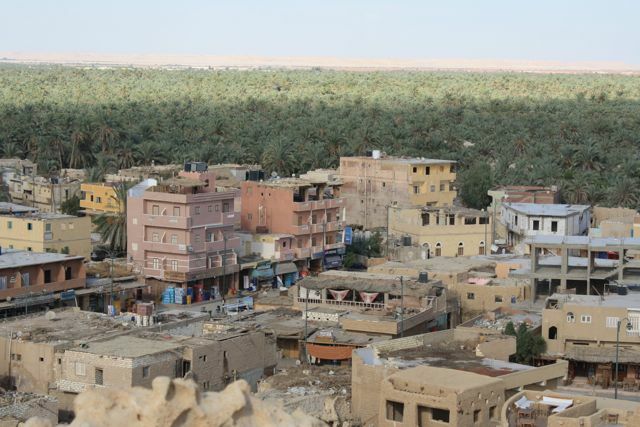 Siwa is a town in the midst of the Sahara Desert that has been settled for more than 10,000 years. There are about 13,000 people living there, caring for 300,000 date trees and 70,000 olive trees. 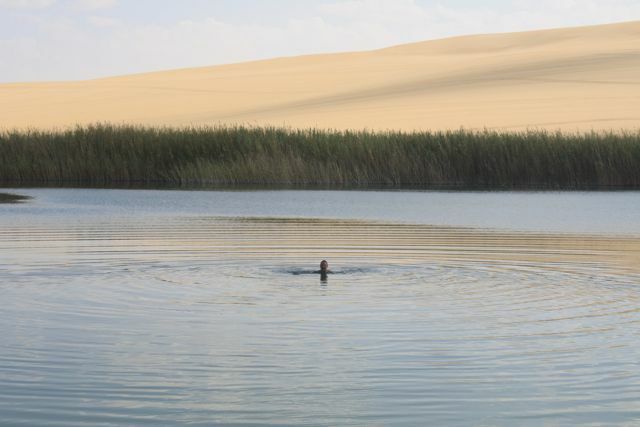 And here is one of the fascinating things about Siwa oasis: all the water comes from underground. 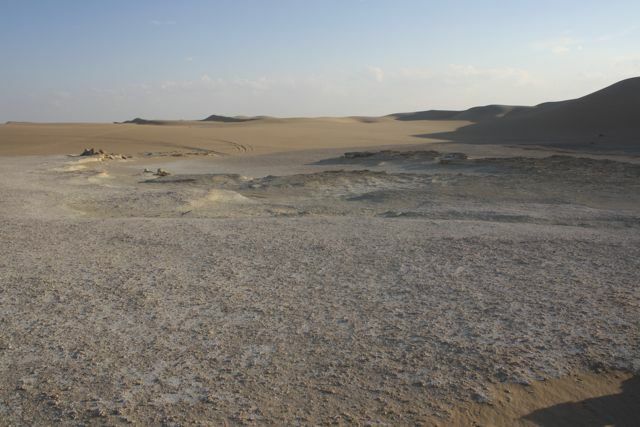 The last time it really rained in Siwa was 1926. Yet somehow, for thousands of years, this little dot of green has existed in the midst of the Sahara desert. This is what I believe, beloved: that God permits Siwa oasis to exist so that when people are traveling in the desert, they can see a glimpse of how the world can be. You can drive, as I did, for eight hours across a roadless, sand-swept wilderness…and arrive at an amazing pocket of life and health and wholeness, like this lake on the edge of Siwa – a body of fresh, clear, cool water as big as this city block that I ran and jumped and swam in…and caught fish in! And as I reflected on that, I wondered… “How many of us experience life as a desert? How many of us live day after day, week after week, year after year encountering nothing but pain and death and alienation and anger and barrenness and abuse? Some of us face incredibly devastating struggles moment by moment, and wonder when, if ever, life will make sense. Some of us journey day after day and grow hopeless because there are no signs of life on the roads that we travel. And, to be honest, some of us face inconveniences that grate on us like sand in our underwear and we allow those irritations to debilitate or distract us. For too many of the people we know and love, and for too many people in this room – life is like the desert. My belief is that if, in fact, God allows Siwa oasis to serve as a glimpse of what creation can be like; if God allows seashells to litter the desert floor as a reminder of his eternal intentions for the creation, then maybe God is calling us to be that kind of glimpse, that kind of reminder for his children who are wandering the deserts of life in 21st century North America. These are the promises of God that pour forth from the prophet Isaiah. God uses Isaiah to remind the people that although they can see the desert now, they had better not get used to it, because it’s not going to be that way for eternity. What we experience as harsh and barren and painful and rough and hot and sandy and just plain irritating now…will become a pool of refreshment and a spring of healing and an ocean of life. And it’s not only for some time in the future. There are glimpses of it now! This community is an oasis! Did you know that? Can I tell you how badly I missed you? Yes, I know, I was away having the adventure of a lifetime. But you need to know that I longed for the people, the mission, the ministry of Crafton Heights. The places I went – how I loved them…as a traveler. But the place I am from – how I need that as a home! When I left in July, I asked you to take a look at who you were, what you had, and what you needed; I promised to do the same. As I come home, I am here to ask you to take care of this oasis. I am asking you to speak well and truthfully to each other. To give yourself to the mission of this place. To love God and each other, and to serve this community. And most importantly, to be on the lookout for those who have come to believe that sand and heat and death have the last word; who believe that the desert is the ultimate reality – and to invite them to experience the life that Christ has given to us. I’m not going to lie – Siwa wasn’t perfect. It was hot there, and sandy. But there was great life there in the midst of a terrible desert. In the same way, we are not the church that we are going to be…but let me encourage you to remember that this community is for you a cool spring. To take the time to enjoy the life that you have been given, and to share that life. God is doing a new thing in and through His people. Us! Isaiah said so. I believe him. Thanks be to God! Amen. I received a beautiful gift at a reception following this worship, and I’ll post photos of that at another time. In the meantime, thanks for your company on the journey! The day before I left for South America and the beginning of this wonderful adventure, I did a children’s sermon wherein I took the kids into my study at the Crafton Heights church and asked them to look around. The small room was a jumble of boxes and piles of books. I explained to the children that I would be going away for a few months, and that while I was away, some people would be working to make some (much needed) changes to my study. The 1970’s era paneling was coming loose from the walls and the stained glass window was coming loose from its moorings. After all, I moved into that space almost twenty years ago, and it’s not had much attention since then. I further explained to the kids that when I came back in October, the room would be totally different. I wasn’t sure HOW it would be different, but I knew that there would be some major changes to the room. And that was fitting, I said, because when I came back in October, PASTOR DAVE would be different. The time away would change me, I said. The Pastor Dave who came back wouldn’t be the same Pastor Dave. And if that isn’t enough, the congregation would be different, too. Well, tomorrow morning, my 98 day Sabbatical (actually, a 91 day Sabbatical and 7 days of vacation) will be history. I’ll be schlepping my first box of books back into the new study. I’m wondering how the new things I have acquired will fit on my old shelves…or if my old shelves will even be there. More than that, though, I wonder how I’ll do at being Pastor Dave again. One of the wonderful gifts of the past three months has been the ability to explore new places in the globe and new places in myself. Since I returned from Egypt on September 29, I’ve been editing photos and hanging up souvenirs and trying to integrate the stuff of my travels into the space of my home and life. I’m nowhere near done with that. In the midst of that time, Sharon and I drove Ariel out to Chicago and dropped her off at Reba Place Christian Fellowship, where she’ll be spending the next eight months. While the van is empty and the child is in Chicago, if I’m honest with myself, I need to say I’m not finished sending her to Chicago, either. And just as I’ve been reorganizing my home and helping Ariel with hers, I’ve been enjoying the chances to reconnect with friends and neighbors, and have been exploring the ways that our worlds and lives have changed. When I begin my new term of service at the First United Presbyterian Church of Crafton Heights in the morning, I’ll be eager to see how the pieces fit together. We have a great plan in place for this reintegration. Pastor Melissa will be at CHUP until the end of October. Next weekend (October 15-17) is our all-church retreat, and dozens of us will be able to swap stories and listen for the ways that God has moved in the last three months. On November 2, a vessel carrying one Mr. John Carver neared the shores of North America. As they drew close to landing, Mr. Carver and his 101 fellow-travelers made some decisions regarding how they would relate to each other and how those relationships would sustain their lives in the days to come. On September 29, a vessel carrying Dave & Ariel Carver neared the shores of North America. As they drew close to landing, the Carvers and about 200 fellow-travelers were anxious to finish the movies on their personal tv screens, to complain about the dubious quality of the Delta Air Lines egg sandwich, and to plan the timing for their connecting flights. My great-great-great-great-great-great-great-great-great-great-great-uncle, John Carver, was among the group of people we know as the Pilgrims who crossed the Atlantic on board the Mayflower in 1620. They were men and women who, by and large, were religious separatists seeking the freedom to worship the Lord as their consciences dictated, rather than according to the practice of the Church of England. As they drew near to the coast of Massachusetts, it became apparent that they needed some form of order for their life together if they were going to survive the winter in this harsh and strange land. 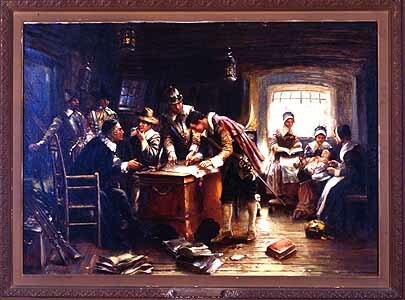 Accordingly, they drew up a document, called the Mayflower Compact, in which they pledged their lives to each other and to the community as they sought, together, “to plant the First Colony in the Northern Parts of Virginia” for “the Glory of God and advancement of the Christian Faith and Honour of our King and Country”. John Carver, William Bradford, and the rest of that group were by no means perfect in either intentions or practice, but their willingness to travel together, to risk their lives together, and to covenant together for the purpose of survival indicates a level of community and involvement that seems remote in our day. Contrast the life and decisions of the Pilgrims with those represented by the people who shared Delta flight 85 from Cairo to New York with Ariel and me. There are, more or less, 250 seats on board a Boeing 767. While far from luxurious, I think that old Uncle John would have gladly traded his berth on the Mayflower and her 66-day voyage through perilous seas for my economy seat on the twelve hour flight. Carver and his fellow pilgrims depended on each other for survival. Ariel and I were encouraged to be as cocooned as possible for the trip: we were put in a specific spot, the lights were dimmed, we were given earphones and personal tv screens and urged to sleep and not be disruptive to the other travelers. It goes without saying that we were not in any significant way connected with either the crew of the airliner nor the people with whom we shared space. We were simply 250 people who, for one reason or another, wanted to get from Cairo to New York. In his excellent book Preaching to Strangers, Will Willimon notes that at one time, when Christians gathered together in worship, they were pilgrims on a journey: people who had come together and who knew that the success of their venture and the authenticity of their faithful witness depended on their ability to live with each other all the time, not simply pass an hour together in the same room. Willimon points out that twenty centuries after the resurrection, the church, more often than not, is more apt to resemble a group of tourists who happen to be riding the same bus but who otherwise have no connection with each other. I’ve thought a lot about Willimon’s thesis these past few weeks. I have been a tourist traveling amongst other tourists. While our little group of twelve came to know, appreciate, and respect each other during the three weeks we spent traipsing around the Middle East, in no sense did we really have a hold on each other’s lives. In fact, at the end of the time together, I’m not sure that any one of us could have given the first and last name of the entire group. We were friendly, and many of us have expressed an interest in staying in touch…but we were not (nor did we intend to become) a lasting community. While it is unrealistic to expect that every group of people with whom we happen to share space will become for us a community that involves the kind of risk, trust, planning, and commitment that characterized the colonists in 1620 I think it is fair to ask, with whom do you share that kind of relationship? Who knows you? Who holds you accountable to the promises you make? Who helps you become more than you thought that you could? Who reminds you that you are more than you think you are on your worst days and not as great as you think you are on your best days? I think that a lot of why I was so deeply longing for home in the last week or so of the greatest travel adventure of my life so far is the fact that while I was surrounded by people who seemed to like me well enough and even enjoyed my presence, there was no permanence to those relationships and no sense in which we belonged to each other. We had taken time out from our “real lives” to engage on this adventure, and then, come the beginning of October, we’d head back to Australia, Canada, Germany, or the US and resume our lives as pharmacists, government workers, students, pastors, or whatever else we may have been. Being present in that world necessitated an absence from this one – and I have discovered that I am more and more a person who longs for the deep connection and intimacy that is more common among pilgrims than it is among tourists. 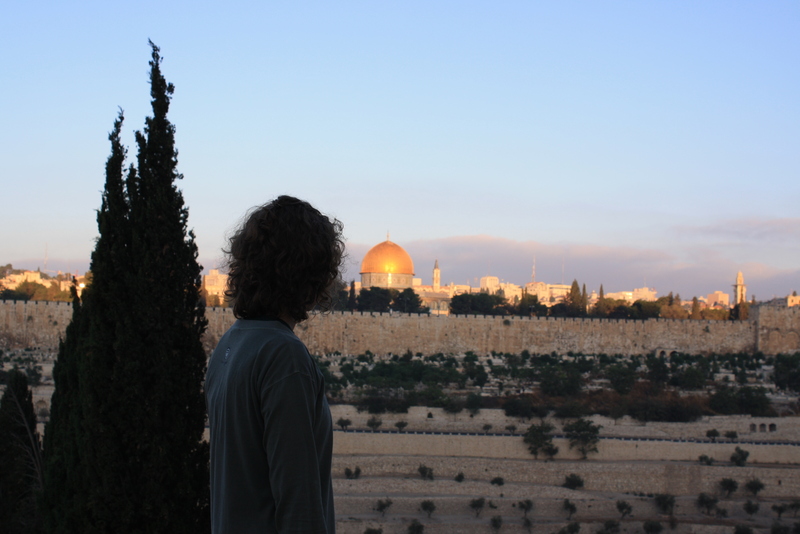 Ariel greets the sunrise as she stands on the Mount of Olives and looks toward the Dome of the Rock and the Old City of Jerusalem. She has come from a wonderful place, and is in God's hands as she ventures to a new one. On Sunday, Sharon and I will be taking Ariel to Chicago, where she has been accepted for an apprenticeship with the Reba Place Christian Fellowship. This group of believers has been together for more than fifty years and have covenanted to follow Christ together in an intentional community. I am delighted with Ariel’s desire to plunge herself into that collection of relationships and eager to see how the Lord will use these months in the story He is writing across her life. The reason that Norm and Cliff and Sam and Dianne kept returning to the bar was because the people there were connected to them and knew their stories. My hope and prayer is that each of us has the ability to be wound into a community where everybody knows our names – and that we rest in the strength of that community to grow into the people God would have us be. So here’s to old Uncle John and his community that changed the world. And here’s to the friends and family who help me to believe that maybe we can change the world. And here’s to the community of God’s people at Reba Place who are waiting for Ariel to arrive. And here’s hoping that you have someone, someplace, with whom you share the pilgrimage and not merely the airplane.